There's a cool new tool in the Library Extension for Google Chrome. Like many people (and even as a librarian), I often find myself clicking "purchase" on Amazon before checking with my local library for a book that I am interested in. As mentioned on Lifehacker, Amazon may be convenient, but nothing beats free. After you install the Library Extension for Chrome, any searches that you do on Amazon will yield results from your local library, too. From Library Extension's website: Easily see what titles are available at your local library as you browse for books! As you browse books and e-books, the Library Extension can check your library's online catalog and display the availability of that item on the same page. If the book is available at your library, you'll know instantly – and have a quick, convenient link to reserve the title! The extension allows you to pick your favorite local libraries and add them to a list. 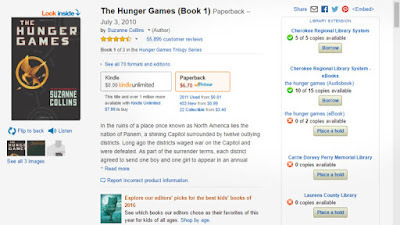 Then, when you shop for books on Amazon (or other), the extension adds a box that will let you know if those books are available at your library. It's a wonderfully ingenious extension, and it will be available for Firefox soon.